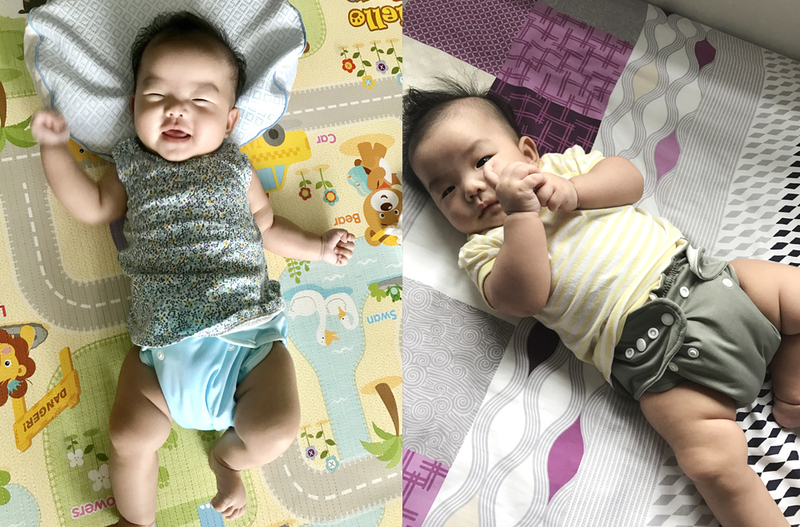 First-time mummy Chelsia Chan takes on the challenge of using cloth diapers for the very first time and shares her experiences of using four commonly found brands in Singapore with Mummyfique. What made you want to try cloth diapers? Before I started, I thought that cloth diapering sounded troublesome. When my daughter Emma came along, I used disposable diapers. However, one day I came across an article online that said disposable diapers take 250-500 years to decompose. I was taken aback as I alone use eight to 10 diapers a day. A quick search online led me to some mummy bloggers who use cloth diapers and I was amazed that cloth diapering was not as archaic as I thought. Instead of a bundle of cloth pinned around the child, they now have shells, inserts and liners. Now that I have been using them for some time, I have seen the benefits of cloth diapering. The skin on Emma’s bum is not as red as before and the red marks that were left by ill-fitting diapers have disappeared – the fit of cloth diapers can be customised to your baby’s size. Was it difficult to figure out how to use cloth diapers? I have to admit that using cloth diapers was intimidating initially. There are several types of cloth diapers and they come with countless number of snaps. Thankfully there were many videos on YouTube that I could reference. Even then, the first few days were tough as I had to figure out how to adjust the snaps. After a few days of fiddling with the snaps, I got the hang of things and from that point forth, putting Emma in cloth diapers was a breeze. What was your experience of using cloth diapers over a few weeks? 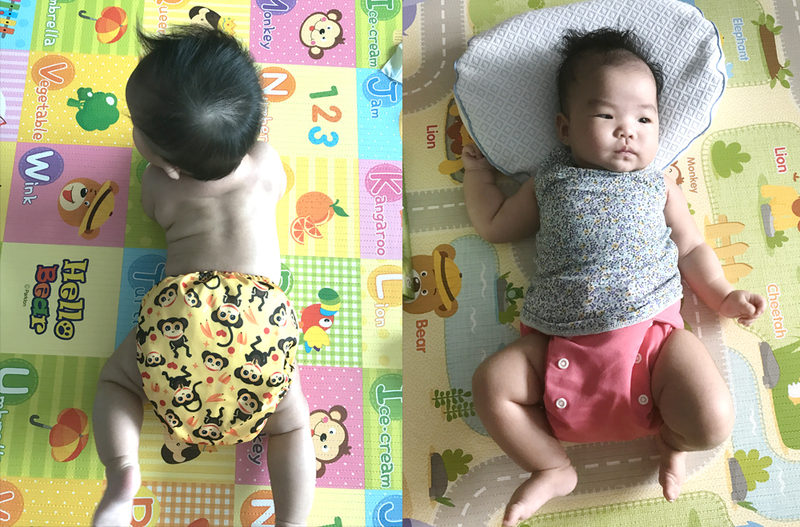 Initially, I only used the cloth diapers during the day and went with disposables at night. This is because I was still unfamiliar with the cloth diapers and did not trust myself to be able to change her fast in the dark. However, in less than two weeks, we were on full cloth diapers and speed was no longer an issue. I did experience some leakage at the start but this was because I did not tuck the edges of the liners into the diaper. Cloth diapers come with aesthetic benefits too. In the past, when I dressed Emma in tops and dresses, I would put her in shorts to hide the diaper. I no longer do it with cloth diapers as their colourful prints let them act like shorts or pretty bloomers. After wearing cloth diapers, Emma is more aware of when she has peed and pooped, and will fuss for us to change her. As disposable diapers absorbed her waste products immediately, it was only when we suspected that her diaper was full that we changed her. The only inconvenient thing about using cloth diapers is that I have to carry more things when we go out. A bigger wet bag is needed for the soiled diapers, and they can be quite heavy when they are soiled. 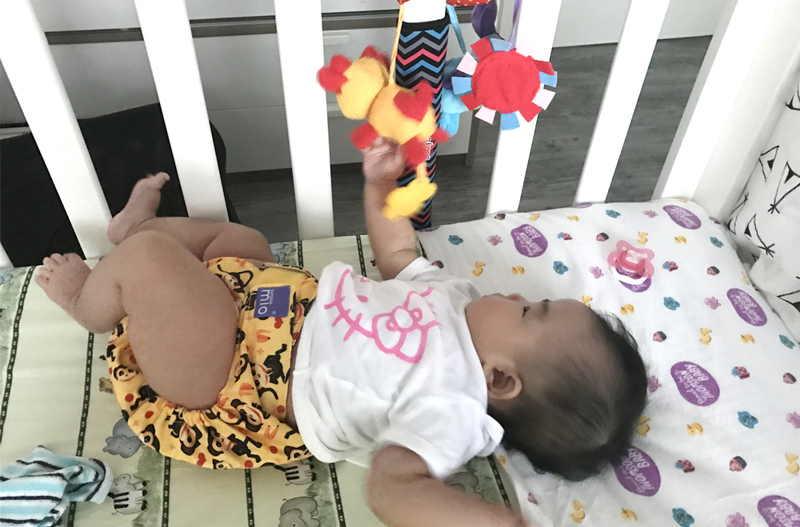 What challenges did you face while using cloth diapers? For me, the biggest challenge with cloth diapers was laundering. As I hand wash all of Emma’s clothes, I initially did the same for the cloth diapers. However, the thick inserts took two full days to air dry. I learnt that to get them dry fast and ready for use, machine spinning was the most effective way. I now have a pail of water in the bathroom that’s used to soak soiled diapers. If Emma has pooped, I discard the liners with the poop, and wash the diaper immediately. The liner actually does a pretty good job of holding the poop and it hardly stains the diaper. At the end of the day, I rinse the shells and the inserts lightly, and place everything in the washing machine on a spin cycle. They are usually ready to be used the next day. 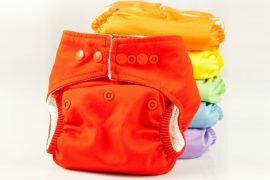 What are your thoughts about the cloth diaper brands that you have tried? Bumwear has one of the softest inner material of those I tried. This material was also the easiest to wash poop off with almost no stains at all. It also has snaps inside if you would like to secure an additional insert. The inserts also come with a little sleeve for easy insertion into the shell. 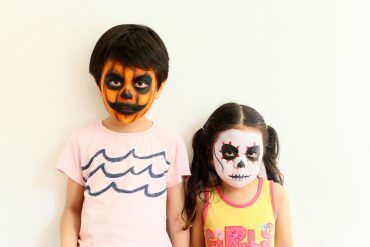 Unfortunately, the cutting did not seem to suit Emma – it was slightly narrower at the base compared to the other brands I tried and bum cheeks would peek out of the diaper. The widest-possible setting around the thigh area was also a little too snug for my daughter’s generous thighs. Moo Moo Kow was the diaper that intimidated me the most – it has 40 different snaps on one diaper. However, this meant that it was the diaper with the most customisable fit. Emma seemed the most comfortable in Moo Moo Kow. That said, it was the hardest diaper to put on as it has a lot of snaps to fiddle with. And when Emma learnt to flip, it became an even bigger challenge. The material used in the inner lining was also not as soft as the other brands I tried. The lining of the Charlie Banana diaper is made from a luxurious material and Emma loved wearing them. It comes with a few basic snaps to adjust the size and the elastic portion at the back is longer than the one on the Bumwear diapers. The only complaint I have is that the base of the Charlie Banana diaper is smaller than I would like. The design is simple and easy to understand. There are snaps to adjust the length and Velcro tabs around the waist area to make the diaper fit right. Its design made it very easy to put it on Emma, especially when she wouldn’t stop flipping. The base is wide and the lining is very comfortable too. The shell is also the longest among the brands I tried and it looks the most secure. However, as the insert is permanently attached to the shell, it is slightly harder to wash. Machine-washing this diaper is a must. When I hand washed it, it took three days to dry completely. As much as I liked this diaper, its waterproof lining started to peel after a few weeks of use. Would you still continue to use cloth diapers after this experience? My impression of cloth diapers is completely changed now. I like how comfortable Emma is in them and how healthy her skin looks. Except for some extra effort on the laundry front, it actually is quite easy to use. It saves me a lot of money and it is great for the environment too. However, if we are going out for a long time, I still prefer to use disposables so I do not have to bring the bulky diapers around. Ditto if Emma is having diarrhea and I have to change her diapers frequently. All in all, I had a wonderful experience with the cloth diapers and I am already looking to getting more to use with Emma. Read about another mummies cloth diapering experience here.